I stole this idea from Kristy @placido who may have stolen it from Crystal @srtabarragán…..
We are reading Vida y Muerte en la Mara Salvatrucha 13. Students interact with the text by tweeting from one character to another and retweeting comments that could be related to the novel. They interact with each other’s work by replying to classmates tweets. We’ve only just begun but they are already doing some deep thinking! I’ve even had a couple of “subtweets”! I added the project information! I really like this idea! You teach Spanish and Digital Leadership at the same time. Thanks for sharing. 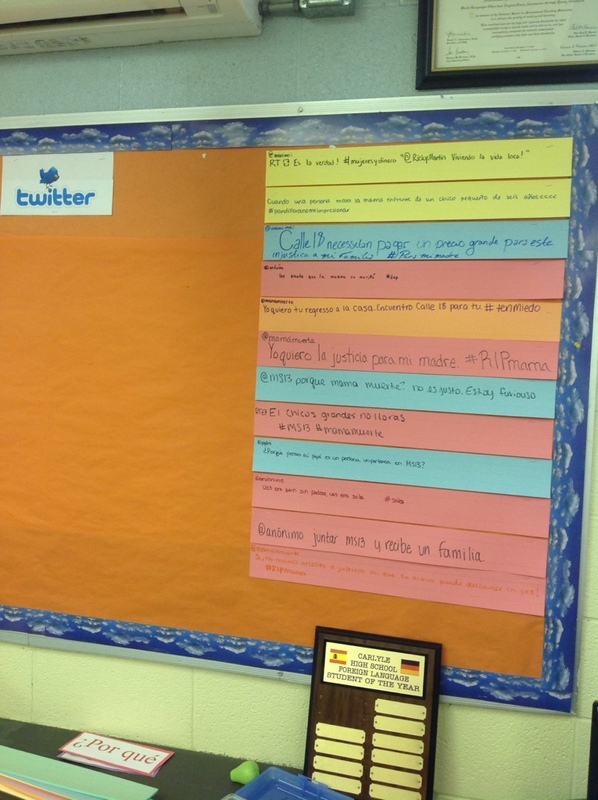 How did you combine the twitter board in class with the worksheet you gave them? How did you choose which ones to post? My students would LOVE to do something like this! They wrote their tweets on the worksheet and then transferred them to a sentence strip. All were displayed, like a regular twitter line they just covered up the old ones w new!